Projection Designer Clint Allen and 4Wall Bring New Projection Mapping Experience to ‘The Wiz’ Musical at Ford’s Theatre | Press Center | 4Wall Entertainment, Inc.
Washington, D.C.- The Tony Award-winning musical soul adaptation of The Wizard of Oz, The Wiz, made its way back to the stage this month at the historic Ford's Theatre in Washington, D.C. Projection Designer Clint Allen utilized Epson Pro Laser Projectors from 4Wall Entertainment to bring modern projection mapping technology to this musical feast featuring soul, gospel, R&B and pop. The Wiz is a large show and requires a multitude of distinct set locations to tell the story. 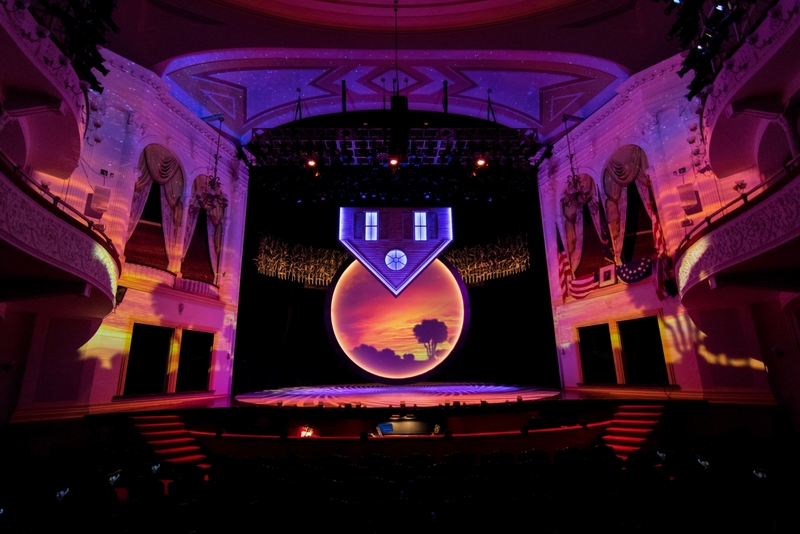 "Ford's Theatre did not have enough physical space to accommodate all the scenery required for the production, so we decided to incorporate video," explained Projection Designer Clint Allen. "We made use of the theatre's large white walls and integrated them into the design to envelop the audience in the experience." 4Wall provided a projection package that included 7 Epson Pro Laser Projectors that had a combined output of over 100,000 lumens. "The laser projectors gave us the ability to place projectors in any orientation without worrying about lamps," said Allen. "The low fan noise was superb as well and allowed us to get them close to the audience without being a distraction." Allen used (2) Epson Pro L1505U Laser WUXGA 3LCD Projectors in portrait mode for the sidewalls and (2) in landscape mode for the upper arch. (2) Epson Pro L1755U Laser WUXGA 3LCD Projectors edge blended a disc that is centered on the stage. (1) Epson Pro L25000U Laser WUXGA 3LCD Projector was used to fill the entire proscenium from the front. "Epson became the obvious choice due to wider lens throws for the 15k lumen projectors," explained Allen. "We used the .64-.77 lenses in the rear and only needed two projectors. With any other manufacturer, we would have had to use 4 projectors." Allen was impressed with 4Wall's newly acquired Epson Pro L25000U Projector that hung about 10 feet above the audience. "This projector worked beautifully and gave us a lot of punch even on the black velour curtains," said Allen. "I was able to tie the entire space together with this projector." The Wiz has opened to numerous sold out shows and positive reviews in part to Allen's projection design and a 4Wall rental package. Allen spoke of the service 4Wall provided. "This was my first time using 4Wall for a video package, and the response was great. When we needed a KVM kit or some technical support, they responded quickly and efficiently," said Allen. "Different 4Wall locations were involved at various points in the process and each was attentive and helpful." For more upcoming dates for The Wiz musical, visit the Ford's Theatre website here.